How Do I Register To File? How Do I Add A Firm User? How Do I Add An Attorney To My Account? Navigate to https://nevada.tylerhost.net/OfsWeb/ in your web browser. You will be directed to the User Information page. • Complete all fields with red borders. • Password parameters: Your password must be at least 8 characters and include an upper case letter, a lowercase letter, and a number or special character. You will be directed to the Registration Options. Select the Firm Account option. This is the appropriate option for both attorneys and Justice Partners. Please Note: The account approval box should remain unchecked. The User Approval feature is not available at this time. Complete the Contact information and click Next. You will be redirected to a success page. Please go to your email to activate your e-filing account. Click on the orange Actions tab on the upper right hand side of the home page. Click on Firm Users. Scroll down to Join My Firm and click on the icon that looks like an Envelope. This will send an email to your new user with steps for account activation. Once the user enters their information using the link you provide, they will gain access to E-File as a part of your firm. Note that this invite link only works if you have Outlook or a similar default email program. If you do not have this functionality, you may copy and paste the link into an email manually. From the Firm Users page, click on the orange Actions tab on the upper right hand side of the screen. Find the user that you wish to grant administrative access and click on their name. 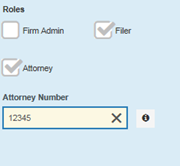 Select the Firm Admin check box and Save Changes. Click on Orange Actions tab located in the upper right hand corner. Click on Enter Account Information. Input the Cardholder Information. Click Continue (bottom right corner). You will be redirected to a Summary Page. Verify that the Information is correct. Click Save Information. Your payment account is now saved in the system for future use. Name the Payment Account. This name is internal to your firm. 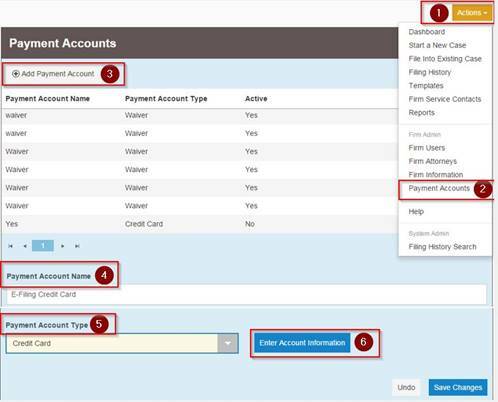 Select the Draw Down account type and click on Enter Account Information. Input the Account Number. Please note that draw down accounts are case sensitive. Click on the Select Locations button. Single click on Clark District Probate/Guardianship to select all locations. Click Save. Click on Verify Draw Down Information. The system will validate your account (this process may take a minute. Once this is complete, close the verification window and Save Changes. Attorneys can be added by a firm administrator or can be approved by a firm administrator after the attorney self-registers. Click the orange Actions button, in the upper right hand corner of the home page. Click the Add New Attorney button. Fill out the Attorney number (BAR number), along with the attorneys first and last name in the fields provided. Please note that the system requires an attorney in your firm whether you have one or not. For agencies that file but don•t have an attorney, the recommended practice is to enter BAR number 0 with the name DO NOT USE so your users don•t inadvertently add an invalid attorney to their submissions.• Filings will not process correctly if an invalid attorney is included. The system will send a verification message that the attorney was added to your firm. To electronically serve a party or attorney on a case, there are two separate steps that must be completed. • The service contacts have to be created. • You will need to link your contacts to your cases. Locate your Firm Service Contacts list under the Orange Actions menu. Please note: Contacts added to this list should only be the user or members of the user•s firm. Only the firm that creates the contact can maintain the contact (update any contact information, such as email or address) and remove themselves from any cases they are erroneously added to. It is recommended to not add contacts from other firms to your Firm Service Contacts. After the service contacts are created, you will want to return to your Filer Dashboard (select the orange Home button at the top right of your screen) and start to link your contacts to your cases. There are two ways to accomplish this. 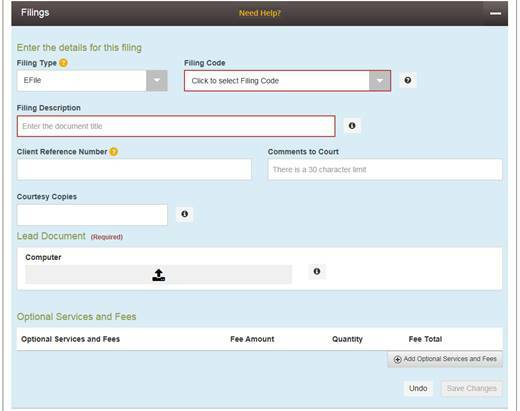 Option 2: Add service contacts during the filing process. Search for the case by selecting File into Existing Case. Select your location from the drop down menu, enter your case number OR party information, and select search. 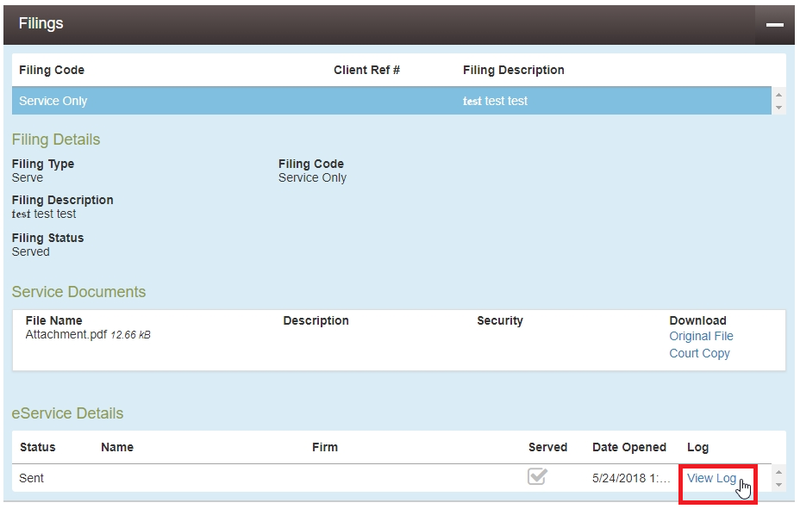 Once your case populates, click on the Actions tab located on the right hand side of the case. Then select View Service Contacts. This will bring up the service contacts list. Locate the party that you would like to attach your service contact information to. Then select the Actions tab located to the right of that party. Select Add From Firm Service Contacts. Clicking this option will populate a list of all your service contacts from your Master Service Contact List. Click the checkbox next to the desired name(s) that you would like to associate with this party/case and select close. After you select close you will be brought back to the list of parties associated with the case and your service contact information will now display under the party you represent. 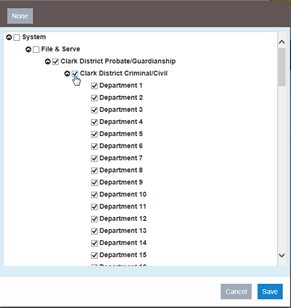 Once the case populates, click on the Actions tab to the right of the case and select File into Case. Select Efile & Serve or Serve only for your Filing Type. 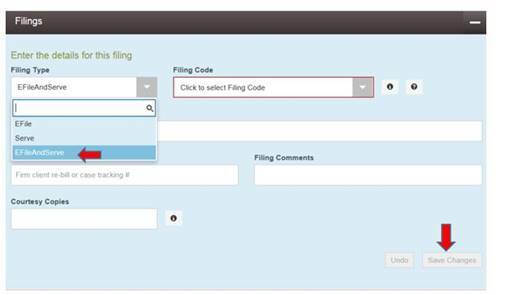 Complete the remaining required fields in the Filings Section & select Save Changes. Once you select Save Changes you will be brought down to the Service Contact section. Locate the party you need to attach you service contact to. Locate the party that you would like to attach your service contact information to. Then select the Actions tab located to the right of that party. Select Add From Firm Service Contacts if you already have the contact created. Alternatively, you can select Add New Service Contact and enter the contact information to create a new contact party. Clicking the Add From Firm Service Contacts option will populate a list of all your service contacts from your Master Service Contact List. Click the checkbox next to the desired name(s) that you would like to associate with this party/case and select close. Click the Actions tab to the right of their name. Select Add From Firm Service Contact. Select the desired name(s) from your Master Service Contact List. Select Close. Please Note: You also have the option to serve the opposing counsel in this section. If you need to serve the opposing counsel and they have not added themselves to the case, you will be unable to serve them via electronic service until they do so. To view the status of documents you have served through File & Serve, first go to the Filer Dashboard. Click on the Accepted folder under My Filing Activity. Click on the Actions menu for the appropriate case and select View Envelope Details. Scroll to the bottom of the envelope and click View Receipt. Scroll down to eService Details where you will find the status of those served. On the File & Serve Home Page, click on File into Existing Case. Search for and locate the case you wish to remove yourself from. Click on Actions, and then click View Service Contacts. NOTE: If the Remove Contact option is not there, you will need to contact Tyler Technologies with the Request to Remove Service Contact form in the following section. Click Close. The removed contact will no longer receive service on this case. Envelope templates are a powerful new way to quickly file into an existing case or create a new case. These templates allow firm administrators to identify and save any commonly used filing information to jump start an envelope. Common uses include setting up templates for frequently filed case types, saving party information of parties commonly filed on behalf of, or saving common document types. You are able to enter as little or as much information as you want. Once you login to File & Serve you will see the Filer Dashboard. From there, select Use a Template. Click on New Template or, if editing an existing template, click on the Actions button and then Edit Template. If you can file a case, you can make a template! We list some key features of templates on the next page, but for a more detailed breakdown, see our Initial Filing Section. 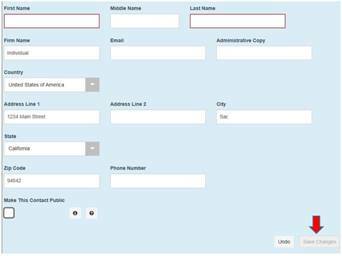 • Set up commonly filed envelope document types. • When using the template, simply click on the document code and upload the appropriate document. • On the Home Page, click on the blue Start a New Case button. • Complete the details for the new case by using the drop down lists in the case information section. Fields with a red border are required. Click Save Changes. • The system will normally pre-populate the required party types based on the selected case type. • Check the Business/Agency box if applicable. Enter your party’s first and last name and any other information you would like to include. • If you are an attorney or filing on behalf of attorney, select your lead attorney from the drop down box. You may add multiple attorneys. To do so, select Add Attorneys. • Click on Save Changes. • Enter the information for the other party following the previous steps. • Optional Services will appear after you save changes to your Lead Document. If you need to add any Optional Services such as subpoenas, citations, copies, etc., click on Add Optional Services and Fees. Then, click in the dropdown box where it says Click to select Optional Service and Fee and add the proper item. You may repeat this process multiple times by clicking on the Add Optional Services and Fees button again. • If you have additional documents to upload click on Add Another Filing. 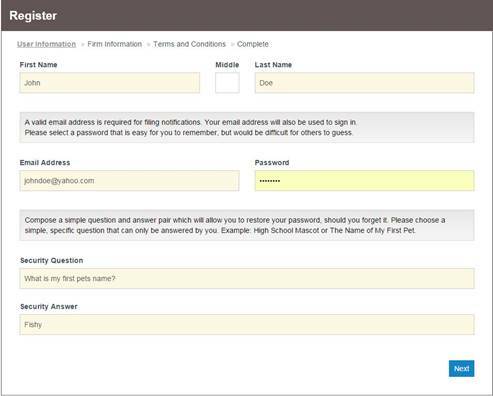 Once you have filled in all of the above information, click Submit. Review your filing on the next page. If you are satisfied and wish to file, click Submit. If you wish to edit your envelope, click Back. To file into an existing case you will first need to search for your existing case. Input the case number OR search by party name. 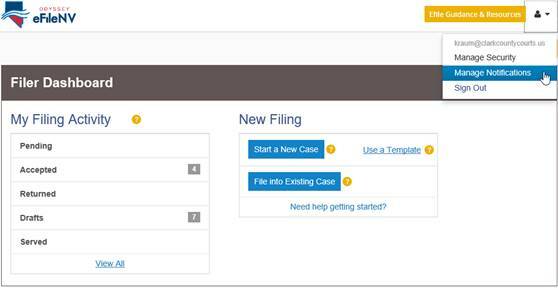 Once the case populates, click on the Actions button to the right of the case information and select File Into Case. Proceed with filing as detailed in the Initial Filing section. On the Odyssey File and Serve site, you have the ability to manage the type and amount of notifications you receive in response to your filings. 1. Log into your Odyssey File and Serve account. How Do I Copy an Envelope? Copying a returned filing allows you to edit your submission quickly. 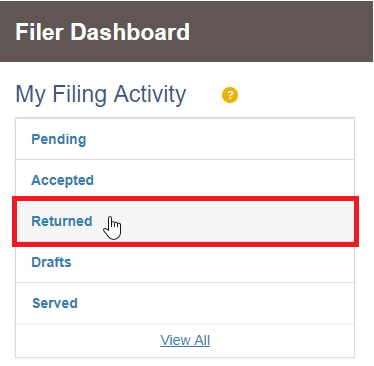 From the Filer Dashboard on the Home Page, click on the Returned button under My Filing Activity. Click on the Actions button on the right side of the page and then select Copy Envelope from the dropdown menu. How Do I View the Email Transmission Log for eService? The Email Transmission log details the status of an eServed document. 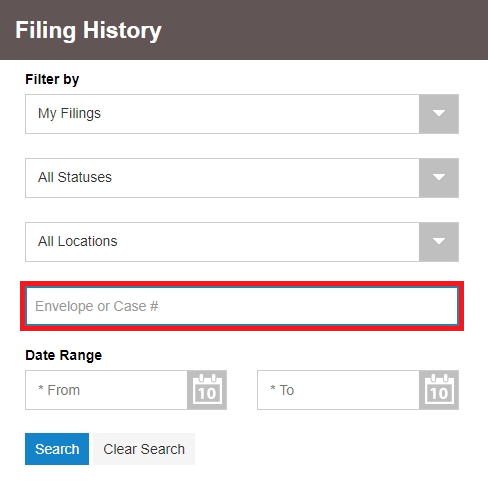 To view the log for an envelope you or another member your firm has filed, first locate the envelope. From the Filer Dashboard on the Home Page, click on the Actions button and then select Filing History from the dropdown menu. Enter the Envelope or Case number and click the Search button. When you locate the envelope you wish to view, click on the Actions button and then select View Envelope Details from the dropdown menu. 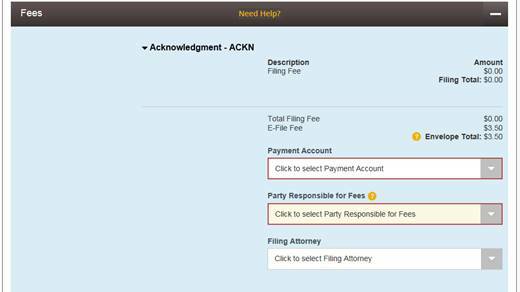 Expand the Filings section by clicking on the check box, or on the row itself. Under the eService Details section, click View Log. · Sealed Documents – Documents to be Filed Under Seal will still need to be brought to the Counter. · Sealed Cases – After May 15th, documents can be electronically filed into a sealed case. 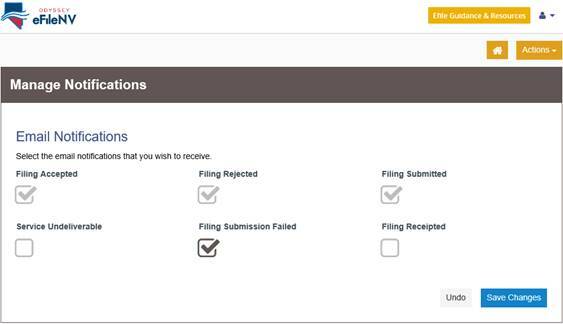 · Returned Filings – you are able to copy a previously submitted envelope that was rejected. · Request for Transfer to Business Court – when filed in an existing case, the Coversheet can now be included in the Envelope as a separate document. · Attachments – must be part of your main document and combined into one PDF – if filing separately, add a Caption page with a descriptive title, i.e. Exhibits 2-5 of Opposition to Motion. · Associate Parties – In the submission screen, associate only your client/party(ies). · Party names – will appear multiple times if there are additional connections – it shouldn’t matter which one you select. · Service contacts were copied from Wiznet on 4/8/17. As you submit documents thru File & Service, please review the service contacts list on your cases to ensure everything is correct. You will not need to re-register in those cases. If the Service contact requires modification or deletion, contact Tyler at 1-800-297-5377. 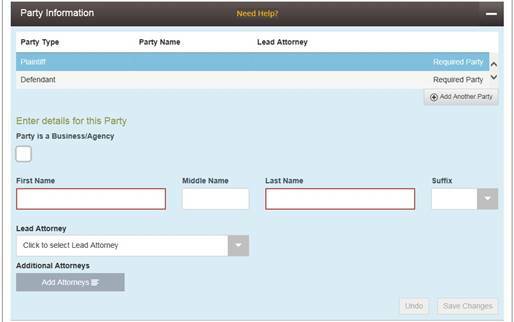 · To register in a case through Odyssey File & Serve, you will associate your contact with a party now. To eliminate multiple emails in cases you represent more than 1 party, do not attach contact information to each. · IAFD – The IAFD should be included in each envelope as a separate document. It can no longer be attached to the Complaint or Answer. Please remember to file an IAFD any time you are submitting an answer for more than one party. · 1st appearance additional parties (Civil case types only) – $30 each when appearing in the same pleading, select 05G in Optional services. · Summons for Issuance – can now be included in your envelopes for new cases, or submitted subsequently in an existing case. Use the SEI document code; the requesting attorney/party’s signature is still required. · Summons to be Filed after Service – Use the SUMM code. · Writs of Execution for Issuance – please attach the Notice of Execution to the back of the Writ, or we will not be able to issue it; the requesting attorney/party’s signature is still required. Use the WEI document code. · Clerks Defaults – select DFLT for issuance and filing. · Voluntary Dismissals by Clerk – select the code closest to the title of your document for issuance and filing. · Citations for Issuance – use CIEI for issuance only. · Citations to be Issued and Filed – Use the CITA event code. · Subpoenas – use the SUBI document code. The requesting attorney/party’s signature is required to be on the document. · Commissions – use COMMI for Issuance only. The requesting attorney/party’s signature is required to be on the Commission; please file the Application or Notice of Taking Deposition in advance of or in the same envelope as the Commission. · Letters – select either LETA for Letters Issued; use LAEI for Letters of Administration Issued. Be sure your Letters contain the Oath and the file date of the Order; and the Letters match the Order as to Bond, Blocked Accounts and Attorney Trust Accounts. When adding documents in the envelope is there a specific order I should use? No. However, the order that you add a document to the envelope will be the same order in which the document will be added to Odyssey. When initiating a new case, if the case type that I selected is different than the case type on the coversheet, will you return my entire envelope? Yes. The entire envelope will be returned. You can copy the returned envelope; correct the filing and resubmit. Is it possible to add additional parties at the time of submitting an amended complaint or Motion to Intervene? Can I get a Default/Writ/Summons/Commission/Letters of Administration issued electronically? Yes. You must ensure that you select the correct corresponding event code. For example, if you would like for our office to issue a Writ of Execution you must select the WEI filing code. Can I file a document Under Seal? No. You will need to bring the original signed document along with the Order to seal the document into the Clerk’s office for manual filing [E.D.C.R. 8.09(a)(1)]. It is recommended that you provide at least one (1) copy of the document for our office to conform and return it to you for your records. How do I submit an Exhibit? Exhibits should be part of your main document and attached to the back. If the Exhibits are too large, you can add a Caption page to the Exhibit, with a title that references the related pleading. Please remember that an envelope can have a maximum combined total 50MB content which is equivalent to approximately 4,500 pages. When do I need to use the Optional Services feature? 1) Probate Petitions/Objection where there may be a question of which fee is applicable. 2) There are additional fees, such as for additional parties on an Answer or Complaint. 3) Your pleading combines 2 actions, such as a 1st appearance and a Peremptory Challenge or a 1st appearance and a Summary Judgment motion. 4) You have selected a filing code that does not have a fee associated with it such as an Opposition and Countermotion for Summary Judgment. When initiating a new case, do I need to submit an IAFD if I only have one (1) Plaintiff/Petitioner? Yes. You can no longer attach an Initial Appearance Fee Disclosure (IAFD) behind the Complaint. The IAFD should be in the same envelope as a lead document with the cover sheet and the complaint each time you initiate a new case. This document is required to assist the court in assessing the required statutory fees. Can I attach an IAFD as the last page of my main document? No. The IAFD must be submitted as a separate lead document in the same envelope. I forgot to include the IAFD in my envelope. Do I have to submit a new envelope or can I cancel the previous envelope? It is recommended that you submit a new envelope and enter a comment referencing the previous envelope number. You can only cancel an envelope if it has a “Submitted” status. Therefore, if it has not been reviewed by a Court Employee and it has a “Submitted” status, then, cancelling the envelope is another option. What does “Under Review” mean? This means someone in the Clerk’s office has opened your envelope and you can no longer cancel the filing. If you find that you need to cancel a pleading that is under review, please contact the Clerk’s office and ask that it be returned.